I wouldn’t describe myself as a particular fan of New Adult books – I like (and occasionally love) the odd NA, but don’t search them out specifically. But I somehow ended up reading two NAs back-to-back: Allison Parr‘s RUSH ME and Erin McCarthy‘s TRUE. 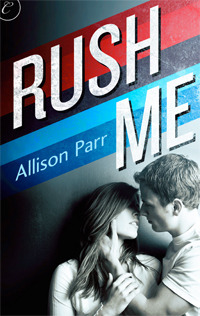 So first, the Allison Parr: RUSH ME was an impulse buy, primarily because it’s currently priced at $2.69 at Carina Press. For that price, I’m certainly willing to give a debut author a shot. And I was glad, because it ended up being one of those compulsively readable books that kept me up for way too late. Over pancake brunches, charity galas and Alexander the Great, Rachael realizes all the judgments she’d made about Ryan are wrong. But how can a Midwestern Irish-Catholic jock with commitment problems and an artsy, gun-shy Jewish New Englander ever forge a partnership? Rachael must let down her barriers if she wants real love–even if that opens her up to pain that could send her back into her emotional shell forever. I loved it, but I can totally see how opinions may be all over the place and this Dear Author review is an alternative take on the book. What works for me, I think, is the escapism aspect in this story (which is very similar to Tammara Webber’s Between The Lines series, so that may be my weak spot), which means that it feels perfectly possible that the girl-next-door gets together with an NFL quarterback. You do have to take the plotline with a pinch of salt – I mean, Rachael accidentally gate-crashing an NFL party? And then becoming BFFs with Ryan’s teammate? Definitely requires a suspension of disbelief, but I went along with it. What I really liked was Allison Parr’s voice – it’s self-ironic and aware. Rachael is abrasive from the start (and to be fair, Ryan doesn’t exactly shower himself in glory either), but I understood where she was coming from and that self-defence mechanism of hers. I also liked that this story felt real (I know, that kind of contradicts my escapism point, but stay with me) – the characters are far from perfect, there’s lust-not-love-at-first-sight and morning-after regrets, but the story’s laced with humour and spark, there’s some growing up being done, and yes, romance. There were various elements that brought the story to life for me, including the strong sense of place in this book – I really liked Rachael’s NYC. I also enjoyed the fact that sports played a large part in this book (disclaimer – I know next to nothing about American football and a true sports fan may just be cringing in horror), and how Rachael’s Jewish heritage was portrayed – again, it felt real, not perfect. And as Rachael’s struggling to find her feet in publishing, we got a peek into the industry (though some potential sequel/prequel bait there felt strangely out of place). I ended the book really rooting for Rachael and Ryan’s relationship – I’m not entirely sure they’ll have a HEA, but it’s definitely a HFN. They’re both in a much better place from where they started, and really, isn’t that what a satisfying story is all about? Next up was Erin McCarthy’s TRUE (and I keep on wanting to call it EASY – I obviously can’t differentiate between one-word titles) – this came to my attention after its giveaway at Dear Author triggered the extremely vocal thread on DA’s new commenting policy. Which goes to show no publicity is bad publicity, right? I then saw the ARC offered on NetGalley, and decided to give it a go. Erin McCarthy is not a new-to-me author but I’ve only read her contemporary adult romances – I’ve really liked her earlier Fast Track books, but ended up feeling fairly indifferent about the more recent ones. Unfortunately, TRUE fell into the latter category for me. It is kind of unfair for me to compare TRUE to RUSH ME because apart from the NA label, they’ve not much in common. TRUE is more of a straight romance, while although RUSH ME has a romance at the core, I felt that it was also a coming-of-age story for Rachael, which adds a bit more dimension. The start of TRUE intrigued me – the setup was in place to see Rory grow up, from feeling like the odd one out to becoming confident in her own skin. In the end, I thought there were mixed results – there were moments where I did connect with Rory, understood her attraction to Tyler and empathised with her struggle between the safety of the familiar and the unknown. But at other times, well, I struggled. I alluded to RUSH ME feeling real, and I felt that this was missing here. Not just the sense of place – this could have been ANother University campus for all I knew, but also other niggling bits. For instance, Tyler’s smoking – controversial for a romance protagonist (and this is a romance). BUT. Tyler smokes all the time, but it never really came off as real – his habit felt like it was a shortcut (a) to signal he was not a typical “good guy”, i.e. that Rory was playing with fire and (b) for Rory to realise when he was feeling awkward (and react accordingly). The actual implications of making out with someone who smokes, the constant smell of smoke, the taste – all of that was missing or glossed over. Also, Rory’s friends – she’s best friends with her roommates. Or so the book says. To me, they were there just to trigger certain plot points – I never got the “why” behind their friendships. I did like Rory’s relationship with her dad’s girlfriend though – for some reason, that slightly-awkward relationship intrigued me the most, probably because it came across as realistic and also matured over the course of the book. And finally, the resolution – or lack of. The ending came across as abrupt and I closed the book feeling that no real resolution had been reached anywhere, not in Rory’s relationship with Tyler, or her dad, or even with her roommates. There is a sequel centering around two of the secondary characters, so it may be that Rory and Tyler’s story is not over yet. TRUE certainly kept me entertained for a couple of hours, but at the end of the day, I never felt invested in the characters and I’m on the fence as to whether I’d pick up the next book. I purchased RUSH ME from the publisher’s site. 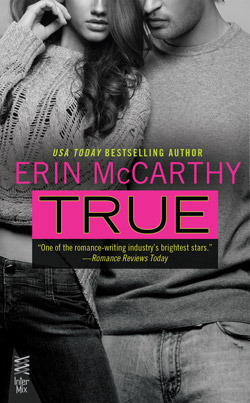 TRUE was an ARC courtesy of the publisher/NetGalley. I’ve been idly wondering about RUSH ME, Li. Thanks for reviewing it now! I’m highly encouraged and think I’ll go check it out for sure. RUSH ME totally worked for me, but like I said, I can see why it’s had mixed reactions across the board. I do hope you try it though – keen to see if the NYC setting (you lived there, right?) rings true or if you just think “ah, tourists!”. Halfway through. This is such a fun book, Li! I think I’m going to try Rush Me. I usually enjoy books about football and it sounds like a good book. Ha – I hope the football parts are authentic then! I’m looking forward to what she writes next. Did Erin McCarthy write anything else other than contemporary romance? Oh wait, you’re referring to her paranormal romance right? Oups, forgot about those. Well sorry True didn’t work for you. I don’t think I’m picking it up because like you, her latest books haven’t worked for me. Yeah, I think she’s also written a couple of YAs – not sure if they’re paranormal or not. There’s a more in-depth discussion at Dear Author (and it has worked for some people! ), so YMMV… The characterisation just didn’t work for me, so I never believed in the story.